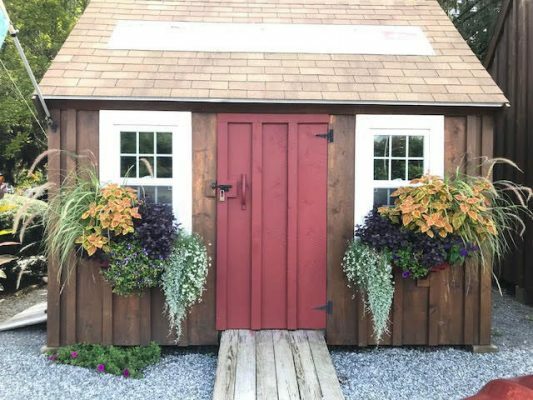 Whether you call them custom sheds, garden sheds, wooden sheds, or storage sheds, New England homeowners know that a durable, well-built shed is an important feature on their properties. Nantucket Sheds has over thirty years of experience building custom-crafted wooden sheds. Our sheds are known for their quality materials, lasting durability, and precise workmanship. Our custom sheds are perfect for storing garden supplies, yard tools, lawn & yard equipment, and other goods. Redwood Garden Center and Nursery is proud to be one of the select group of Nantucket Shed dealers. Let our helpful staff help you pick out the right shed for your home, business and garden. Once you have selected the right shed for your property, our expert builders will deliver the pre-cut, wooden ‘kit’ to your address and construct the shed on site. We offer many different shed sizes, shed styles, and additional options that may be added to your custom shed.